A striking decoration for the marital home! There is so much build up to the big day, the Bride and Groom can be left feeling a little deflated when all of the tension is over so how will they keep the fuzzy feeling for a lifetime? 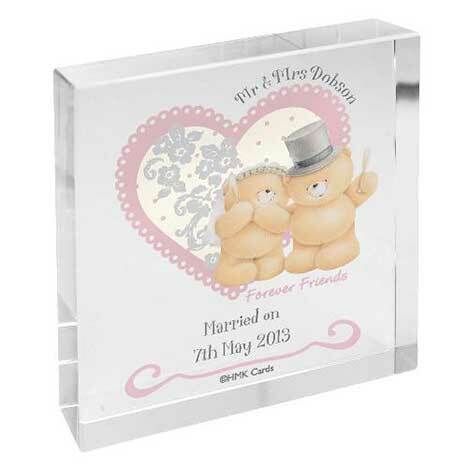 With our stunning personalised Forever Friends crystal memories, you can congratulate the happy Bride and Groom with a keepsake they can cherish for a life time. Beautifully decorated with our loveable Mr and Mrs Forever Friends bear and vintage polka dots, they can decorate their home with this striking gift that will capture and reflect every element of natural light. Don't forget to personalise this Forever Friends Crystal Block with any surname using up to 15 characters and any message spread over 2 line using up to 20 characters per line.